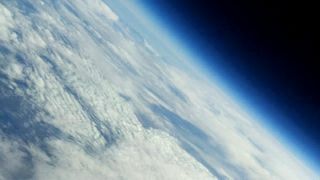 The boundary between Earth and space take center stage in this photo captured by cameras on a balloon-launched paper airplane built by space enthusiasts at The Register in the U.K. The plane was carried to an altitude of about 17 miles before descending back to Earth on Oct. 28, 2010. This story was updated at 2:50 p.m. ET. An oversize paper airplane sent uptoward the edge of spaceby a British online tech publication has snapped stunning photos of thefinalfrontier and the Earth far below. The paper aircraft's Vulture 1mission took place Oct. 28 aspart of the Paper Aircraft Released In Space (PARIS) project conductedby threespace enthusiasts with The Register, an online technology publicationin theU.K. "The project came about as a responseto the Japaneseproposal to throw paper planes from the International Space Station,"Registerwriter Lester Haines told SPACE.com in an e-mail. "We thought we coulddobetter, so we did." Haines and fellow space fans SteveDaniels and John Oatesbuilt the space-photographing plane out of paperstraws and stiff paper,which served as internal ribs. It has a 3-foot (1-meter) wingspan and is covered with a paper skin painted orange andsilver. Theyset the plane loose from a staging ground in Spain. The plane was carried skyward by ahelium balloon and reacheda maximum altitude of about 89,591 feet (27,307 meters), which isnearly 17miles (27.3 km), before descending to Earth and landing in a thickwooded area,according to Register mission updates. The widely recognized edgeof space is about 62 miles (100 km). The Register's Vulture 1 mission isthe latest effort to buildhomemade high-altitudeballoon craft to snap photosof Earth and space. Haines said the project cost about?8,000 (almost USD $13,000)to build the oversize paper plane, obtain the weather balloon andlaunch themission. The Register chronicled the Vulture 1 mission fromstart to finishover the last year. "It was quite an emotional moment tosee the plane gooff into the blue yonder, but recovering the Vulture 1 intact was aonce-in-a-lifetime event," Haines said. "Things got even better whenwe saw the photos, and especially the video footage of the planerelease. Spectacular stuff."